HMD Global had introduced the Nokia X6 mid-ranger last month in China, and it seems like an international variant of the device is coming soon, as it seemingly just got certified in Taiwan. The device just got certified by Taiwan’s NCC authority, which stands for National Communications Commission. The phone appeared at NCC as the Nokia TA-1103, while the Chinese variant comes with the TA-1099 model number. 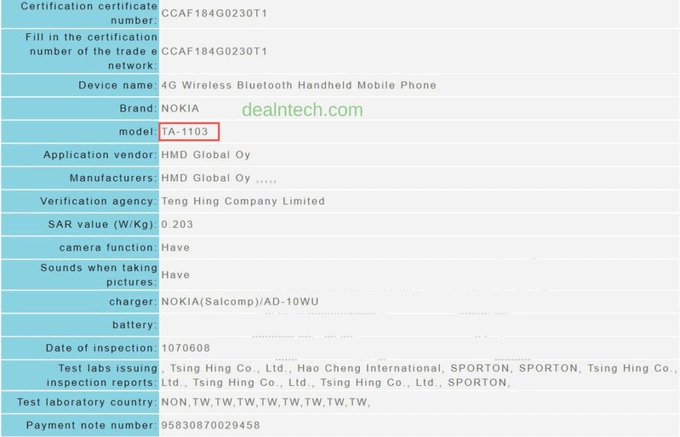 The Nokia TA-1103 actually got its Bluetooth certification quite recently, and that listing, in addition to this one, more or less confirm this is an international variant of the Nokia X6, at least according to the source. NCC did not reveal all that much info regarding the phone, but it did confirm that the device will support 4G LTE connectivity. The Nokia X6 is very popular in China, as HMD Global managed to sell out initial stock of the Nokia X6 in only ten seconds in the country. The company’s Chief Product Officer (CPO), Juho Sarvikas, actually opened up a poll last month, asking people whether they are interested in the Nokia X6, trying to figure out whether the company should release a global variant of the phone or not. After 6,000 votes, 91-percent of consumers said “Yes”, which is probably why we’re seeing such certifications out there, the device’s arrival is imminent at this point. The global variant of the Nokia X6 will probably sport the same specs as the Chinese model, while it will probably look the same as well, so we know exactly what to expect. The device will sport a dual camera setup on the back, where its fingerprint scanner will be included as well. The Nokia X6 comes with really thin bezels, a “chin” below the display, and a display notch up top. The Chinese variant of the Nokia X6 features a 5.8-inch fullHD+ display, 4GB / 6GB of RAM and 32GB / 64GB of expandable storage. The device is fueled by the Snapdragon 636 64-bit octa-core processor, while it includes a 3,060mAh battery. 16 and 5-megapixel cameras are located on the back of the Nokia X6, while a single 16-megapixel camera sits on the phone’s front side. Android 8.1 Oreo comes pre-installed on the Nokia X6, while the phone utilizes Qualcomm’s Quick Charge 3.0 fast charging in order to replenish its 3,060mAh battery pack. If you’d like to know more about the Nokia X6, click here. The post Nokia X6’s Global Variant Seemingly Certified By The NCC appeared first on AndroidHeadlines.com |.